Another great 60s Blue Note set, tenorman Joe Henderson started a prolific couple of years on the seminal label with this 1963 set. There are some parallels with yesterday's Bobby Hutcherson album - although steeped in bop tradition, there are signs of the limits being pushed. This is particularly noticeable in the sound of Tyner who applies some pretty advanced harmonics in his soloing. Check out 'Recorda Me' for an example. Elsewhere things are pretty laid back. Rather than pushing at the avant-garde, the rhythm section settle for gently swinging - and it works well. 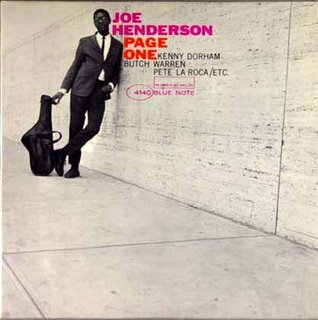 The unobtrusive nature of the backing gives the horns an opportunity to explore - particularly Henderson, who would record some fantastic 'out' music later in his career (check out this post). And the plain backing makes Tyner's innovative contributions that bit more obvious. The record has a democratic feel - contemporary Blue Note releases often featured many of the same musicians, leadership being determined more by composition than by the amount of solo time devoted to a musician. Of course, the more musicians played together, the more alike the compositions became, and a recognisable Blue Note 'sound' was formed. That's no bad thing, as many of the releases from this era in the label's history are superb.